We've learned that the best fitness experience is all about the details. With the 440 ES, you aren't just working out, you're enjoying a comfortable ride. Our oversized seat has added cushioning and easily adjusts so you find the perfect fit. Plus, the extra lumbar support on this recumbent bike really helps line up your posture so your back doesn't get achy as you ride. We know getting and staying fit is a priority to you, but that the space in your home is very valuable. 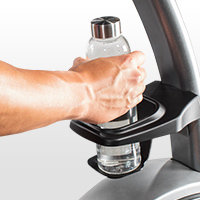 The 440 ES recumbent exercise bike was designed with this in mind. Get the workout you want in the room of your choice without having to worry about taking up too much space. When you need to move it around, it’s easy with the integrated, front-mounted transport wheels. 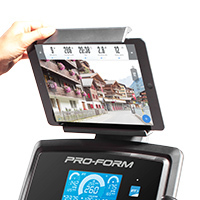 When you step on the pedals of a ProForm® exercise bike, you get instant access to professional training programs fully loaded and ready to go. Now you can enjoy a challenging workout focused on your goals. Just press “Start” and you’re off. Take a seat and go for a ride. 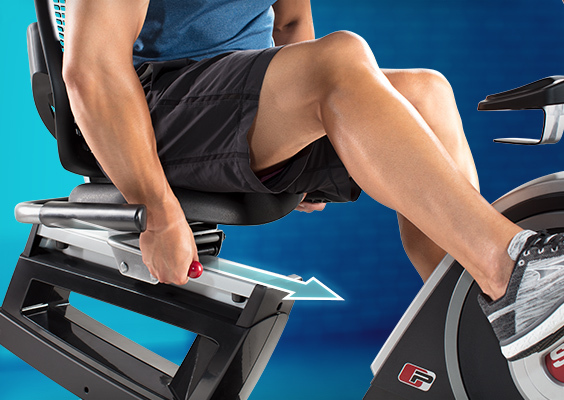 This exercise bike sports a comfortable recumbent frame that places you in a reclined position during your workout. Some of us might not be as flexible as we might want to be. The StepThru™ frame makes it much easier to get on and off than a traditional bike frame. Home is that special place where you can relax and de-stress. That's why we've designed our indoor bikes with oh-so-quiet resistance. With 25 digital resistance levels you can start out easy and progress to intense. Each level is smooth, frictionless, and silent with our patented SMR™ Silent Magnetic Resistance, which allows you to adjust your training intensity without interrupting your workout or anyone around you. 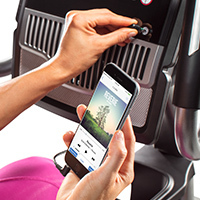 We’ve learned that the best fitness experience is all about the details. With the 440 ES, you aren’t just working out, you’re enjoying a comfortable ride. Our oversized seat has added lumbar support and cushioning. The Easy Glide adjust helps you find a customized fit. Comfortably view the console no matter your height. On the 440 ES, you can easily adjust the angle of the console to the perfect position by simply pushing and tilting the screen. Plug-in to a better sound system. The included audio auxiliary port allows you to listen to your entertainment at a higher volume. Built with dual 2-inch speakers, you’ll be able to hear your music or videos with less complication. 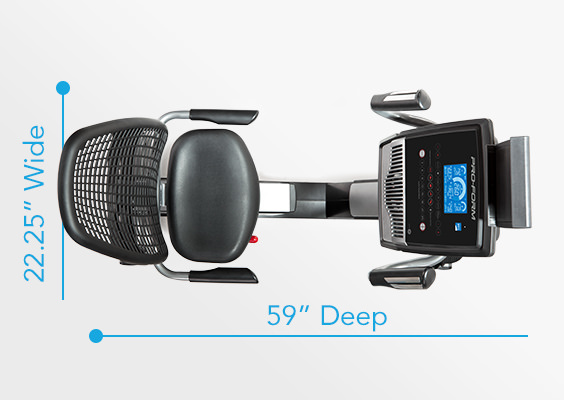 This exercise bike accommodates up to 350 pounds. 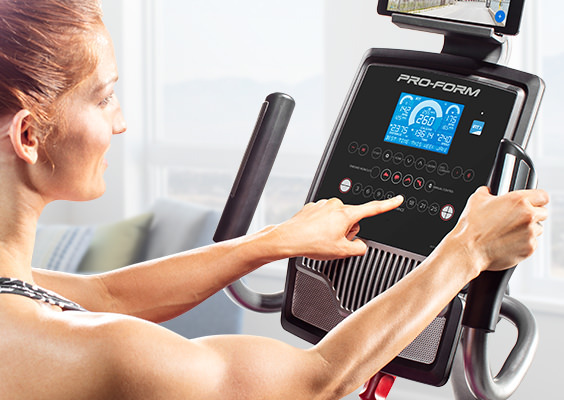 The ProForm® 440 ES Exercise Bike is protected with a Lifetime Frame Warranty, 2-Year Parts Warranty, and 1-Year Labor Warranty. Please note: Lifetime Warranty pertains to the lifetime of the original purchaser. 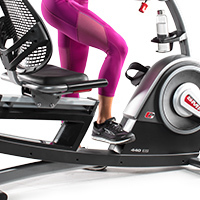 When this exercise bike is fully assembled, the width by depth by height dimensions are 22.25” W x 59” D x 52” H.